Moving away from Sunday School and Creche can be challenging. 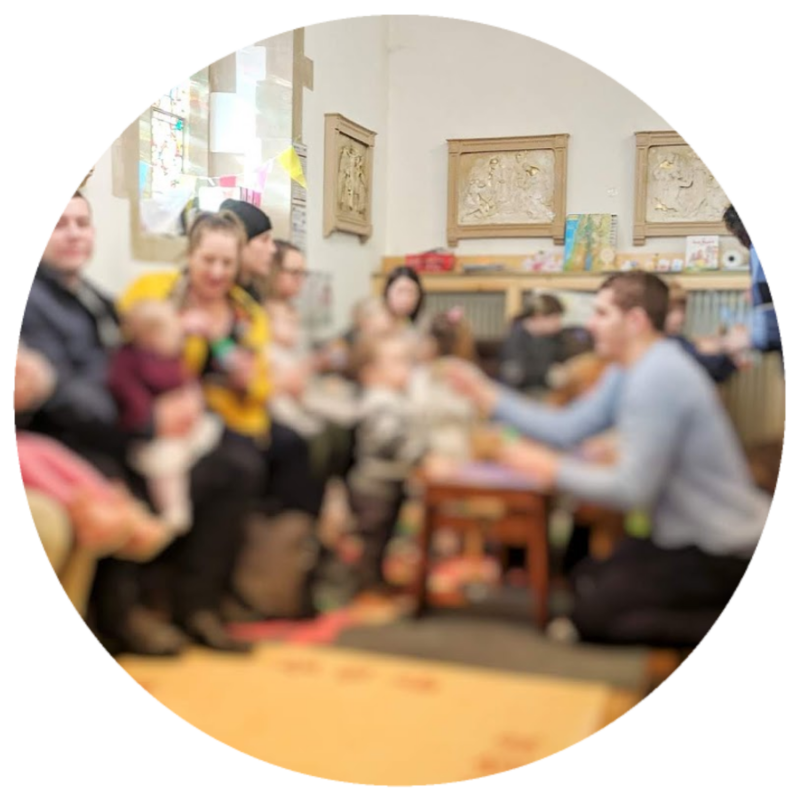 With older primary children and teenagers there are opportunities to sing, serve, lead prayers, read, distribute communion, or help with music and the the PA. For toddlers and younger children here are some suggestions for activities during the service. As well as these liturgical activities you can have lectionary based crafts (for a season or a Sunday), books, and church 'toys' and activities: A play mass set, laminated 'I can see in church' sheets with velcro picture 'answers', bible sticker books, as well as some quiet foam building blocks and other toys. Our children's base station is at the back of church - we find it easier for newcomers to church, although we have tried it at the front as well. We are committed to involving all ages in worship together. Usually someone will be on duty here to help the children worship. But if not here is a guide to resources. There are scarf flags and egg shakers in the black worship box. Join with worship! These can be used any time we are singing. You will be invited to come forward and help light the candles. Jesus is the Light of World. In the worship box there are flower post it notes. Fold the petals in (older children may wish to write a sorry to God on one first) then than place them in the font as we say sorry to God. Watch as they open – we know our sins are forgiven. The large wicker Craft Box has many different crafts and activities in. Including lots of stickers! Stand with the children as we turn towards the gospel reader and sing. The preacher may need helpers and volunteers. Or continue with a craft activity or story. There are Bubbles to blow in the worship box – we offer our prayers to God. Join in with The Peace. Saying ‘Peace be with you’. Some of the children may be invited to come up with the bread and wine and help. Move to the back by the font to see what the Priest is doing at the Altar. Help to ring the bells. Make your way to the front to receive Communion or a Blessing. If there is healing, you will find oil in the worship box to pray with. You will be invited to extinguish the candles. Then wait by the eagle until after the blessing. Help to share the flags among the people. You will be invited to join the procession.